Most will not know who I am. Having started my part-time MRes in September 2014, the 27 months runs out about now. So, hello to the (by now not so) new MLitt course and farewell – though if you are interested in Penguins our paths might still cross. My first ‘Holidaying in Sepia’ blog was written decrying the constant use of technology to which we are all subjected, probably subservient to, and upon which we depend. Relaxation for me involves a good book, preferably in warmer climes, and occasionally accompanied by a drink. So it is that, after a period of intensive work and dissertation submitted by due date, I find myself again enjoying relaxation in the manner described. Books can resonate with readers, be page-turners and can be all-absorbing. They have the power to transport us and energize our minds. 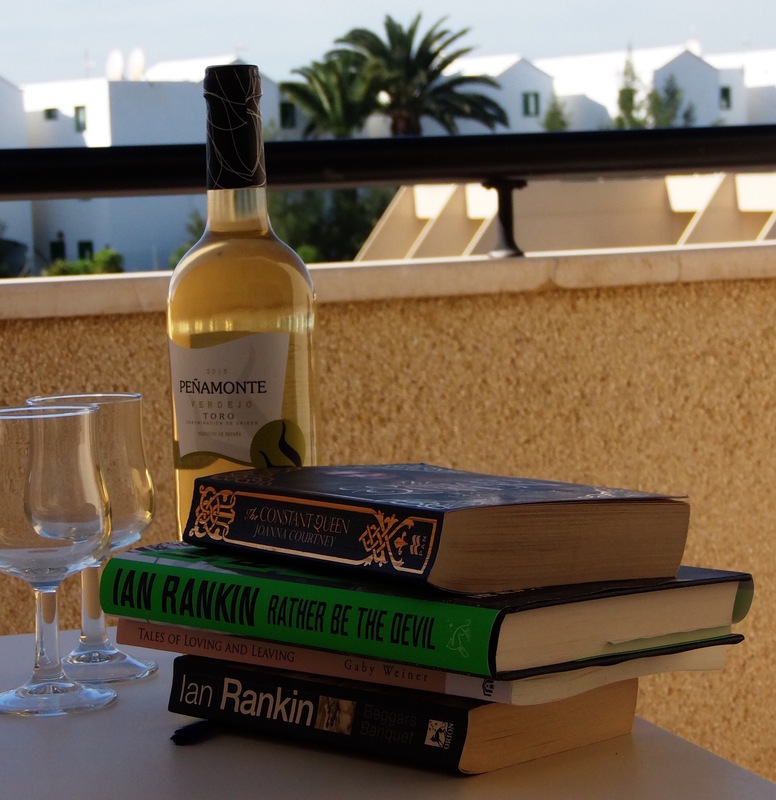 They can allow us to wind down, and dare I admit to the groupies of ‘Bloody Scotland’, that Ian Rankin and Rebus are great escapism, situated in the familiar locations of Auld Reekie and Fife. But where was I? Oh yes, being absorbed by a good book. I was given one, recently published and signed by the author. I found it interesting, stimulating, absorbing, emotional, educational and even disturbing. This was, in the main, a biography. Like any good historical novel, best guess at what might have happened or what the thought processes were are interspersed with fact, documentation and archive material. The people had migrated and travelled, created new lives, and in this book one of the characters came under the scrutiny of MI5. Time for dinner; time to stop reading, take a shower and to get changed. So civilized on holidays. My thoughts were still with the book until I realized that even though my watch might survive, the leather watchstrap had absorbed too much of the shower to remain of use. I suppose part of the reason for my absent-mindedness was that, written by a relative, the book’s central characters just happened to be my grandmother and my aunt! I think I am less likely to have a mishap while reading Rankin. The course at ‘Stirpub’ is great. Enjoy it and reap the rewards. I’m off to get another sangria. Lovers of crime writing had a wonderful weekend in Stirling as the Bloody Scotland festival made its mark on the city for the third year. Featuring authors like Ian Rankin, Kathy Reichs, Sharon Bolton and David Hewson, the festival was a great opportunity for readers to engage with their favorite crime writers and hear interesting (and sometimes hilarious) talks about everything from the writing process and getting published to the independence referendum and feminist protagonists. Along with these entertaining talks, the weekend featured interactive events for festival-goers, including a re-enactment of a serial killer’s trial and a crime scene investigation at Stirling Castle. When I heard about the opportunity to volunteer at the festival, I immediately submitted an application–and I’m so glad I did! It was a fun and informative weekend where I was able to experience first hand the behind-the-scenes workings of a major literary festival. Moreover, attending the event made me realise how festivals like Bloody Scotland provide important marketing opportunities for publishers and their authors. I was assigned to work in Albert Halls, a beautiful venue near the center of town. My main tasks included setting up the hall before an event, directing audience members to their seats, answering questions from attendees and assisting with author signings. One of the major perks of volunteering was the ability to sit in during author talks–I was lucky enough to sit in on two events. The first was between authors Sharon Bolton, Julia Crouch and Helen Fitzgerald and the second between David Hewson and Peter Robinson. Both sessions were highly entertaining and provided insight into the life of authors and the writing process. Of particular interest to me as a publishing student, author Sharon Bolton discussed the complex relationship she has with her editor; she described the feelings of frustration she gets when her editor sends back notes longer than her original manuscript, but conceded that in the end her editor plays an integral role in producing the best book possible. In a time when some are questioning the necessity of publishers, it was reassuring to hear an author recognize and praise the fundamental role of the editor. For me, Bloody Scotland provided valuable insight as a publishing student and delightful entertainment as a book lover. I look forward to attending again in the future! 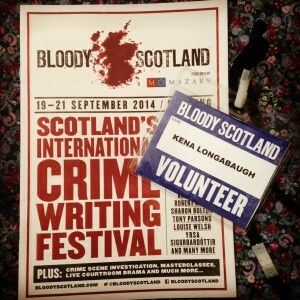 I volunteered for the Bloody Scotland crime writing festival (which took place September 19th-21st) and got to experience the behind-the-scenes work of a major literary event. The amount of effort it requires to keep everything moving smoothly — from helping guests to setting up tech equipment to carting around boxes of books — is astonishing; and that’s just what the volunteers were doing! Staff and festival managers were running around directing author panels and coordinating volunteer efforts while still managing to keep big smiles on their faces. One of the things I noticed quickly about the festival was how close-knit this crime-fiction community was. The guests that I spoke with were all avid readers of crime fiction and were familiar with many, if not all, of the authors’ works. Unlike many other genres, there didn’t seem to be a gender imbalance in the crime community; just as many men attended as women. It was very obvious from the types of books being presented that this genre has a lot of room for diversity as well as a very well-defined market niche. From my experience attending book festivals in Texas, I was surprised that most of the author panels cost money to attend. It is common for American book festivals to be open and free for audience members and to cover costs by relying solely on corporate sponsorship and souvenir sales. In many ways, I think Bloody Scotland missed out on reaching a wider audience by charging guests to see author panels; I think people who might be interested in learning more about crime fiction, but aren’t familiar with certain authors, might be dissuaded from attending because of high prices. 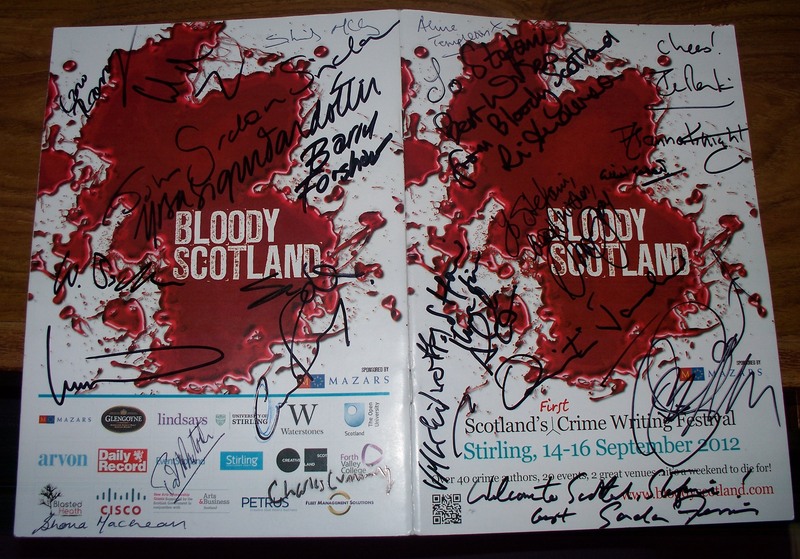 Overall, Bloody Scotland succeeded in connecting authors with their readers and promoting new works to those who are always looking for the next crime to solve. For me, getting to meet the wonderful staff and volunteers as well as listen in on a few author panels was an amazing opportunity. I would highly recommend that anyone interested in learning more about book promotion and marketing strategies volunteer at a book festival; the experience is well worth it. Wednesday 4th June saw the launch of the third Bloody Scotland festival, Scotland’s first and only literary festival dedicated to celebrating crime fiction from all over the world, which will take place from Friday 19th to Sunday 21st of September this year. The intimate lunch time unveiling of this year’s programme was held at Tolbooth, Stirling where Dom Hastings, the festival manager, commented on the diversity of the festival’s proceedings with events ranging from live talks from best-selling and world-renowned crime writers Ian Rankin and Kathy Reichs, to a discussion about the representation of women in crime fiction hosted by the Glasgow Women’s Library and a play re-enacting the trial of notorious serial killer Peter Manual to be held in the fitting setting of Stirling Sheriff Court. As well as putting together a fantastic programme every year, which not only promotes Scotland’s extraordinary love for crime writing but also encourages crime fiction lovers from all over the world to visit Stirling, one of Scotland’s most historic (and haunted!) 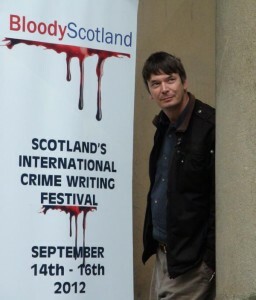 cities, the Bloody Scotland International Crime Writing festival is unique in that it actively encourages crime fiction fans to become creators of crime fiction. weekend pass to the festival – is open to all previously unpublished writers from all over the world. I’m lucky enough to help in the co-ordination of the competition, and it’s really exciting to see undiscovered authors get the opportunity to have their work read by a worldwide audience; last year’s winner was US writer Mindy Quigley who won a landslide public vote for her story ‘The Best Dish’. Not content with inviting the world’s crime-lit-enthusiasts to try their hand at writing short fiction, the festival weekend opens with a day of Crime Writing Masterclasses held at the MacRobert Arts Centre at the University of Stirling on Friday 19th September. The day is full of enlightening and insightful workshops, allowing budding crime writers to spend time refining their writing skills under the guidance of best-selling authors and experts in the publishing field. This year’s line-up of writers and publishers includes Christopher Broomkyre, Helen Sedgwick, Craig Robertson and Sara Hunt to name but a few! As if all this wasn’t enough, Bloody Scotland also holds its annual ‘Pitch Perfect’ event on Sunday 21st September. Sponsored by the Open University Scotland, this competition allows aspiring novelists to pitch their idea to a panel of publishers for the chance to gain invaluable feedback from experts in the field. This year’s panel includes Alison Hennessey, Senior Crime Editor at Harvill Secker, Krystyna Green, Editorial Director for Constable & Robinson crime fiction and Tricia Jackson, Editorial Director at Pan MacMillan. Last year’s ‘Pitch Perfect’ event was brilliant, and it was fascinating to hear some of the ideas for (as yet!) unpublished work and the feedback that the specialists in the field had to offer. What all of these events show is that the Bloody Scotland festival is not just an amazing opportunity for readers and writers to come together in a celebration of all things crime-lit related, but it is also a brilliant occasion dedicated to inspiring the next cohort of crime writers. 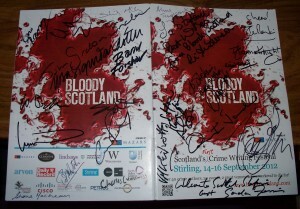 Bloody Scotland, along with the University of Stirling’s Creative Writing team, the Stirling Centre for International Publishing and Communication and Open University Scotland, actively encourages attendees to get involved in crime writing, arguably making Bloody Scotland one of the most inspiring literary festivals in the world. Jenny launched right into the session by emphasising how crime writing is still the fastest growing genre in the UK (and one of the leading internationally), with approximately 30% of the book market. David agreed – crime writing is definitely the most commercially growing genre that is remarkably consistent despite other market or trend fluctuations – fluctuations we know all too well that publishing is harshly dependent on. As the trend moves on, so will the publisher. 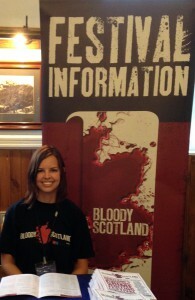 Bloody Scotland 2013 is launched! 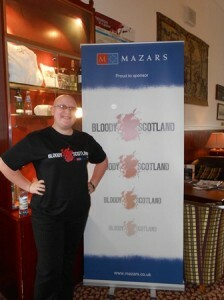 June 5th, 2013 by SCIPC | Posted in Blog | Comments Off on Bloody Scotland 2013 is launched! 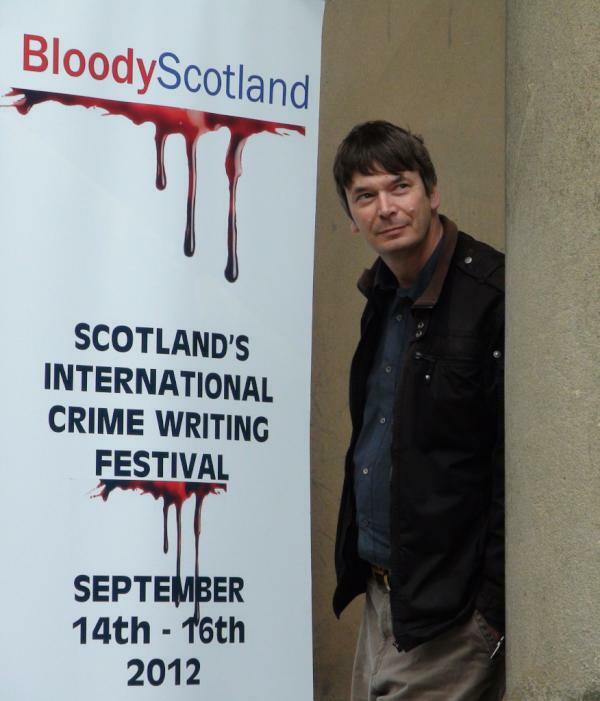 The Stirling Centre for International Publishing and Communication is delighted to be working again this year in partnership with Bloody Scotland and our colleagues in Creative Writing to deliver the 2013 Bloody Scotland Crime Writing Masterclass. 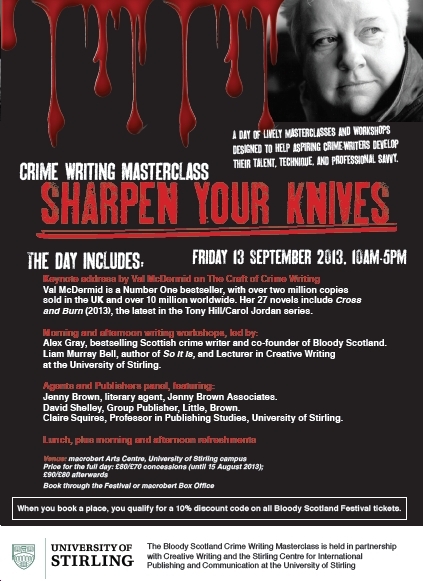 This year’s Masterclass will be held on Friday 13 September 2013, and will feature an enticing array of speakers and workshop leaders for those who want to sharpen their crime writing knives. Our keynote speaker will be bestselling crime novelist Val McDermid. Val is a Number One bestseller, with over two million copies sold in the UK and over 10 million worldwide. She has written 27 novels, including in 2013 Cross and Burn, the latest in the Tony Hill/Carol Jordan series – previously adapted for TV as Wire in the Blood. She will discuss The Craft of Crime Writing. Workshop sessions will be led by Alex Gray, co-founder of Bloody Scotland and bestselling Scottish crime writer, and Liam Murray Bell, author of So It Is and Lecturer in Creative Writing at Stirling. There will also be a publisher and agent panel chaired by Claire Squires, Director of our Centre, and featuring literary agent Jenny Brown and publisher at Little, Brown David Shelley. The day includes lunch and refreshments, and will be held at the Macrobert on the University campus. Tickets are limited, so book fast! If you want more persuading, do take a look at the report of one of the delegates from the 2012 Masterclass. Full details, including how to book, are available from the Bloody Scotland website. In June this year, I heard that a new crime writing festival called Bloody Scotland was offering a day of master classes. I was a bit hesitant to sign up an untried event, but since the University of Stirling were organising it and they had chosen Ann Cleeves as the keynote speaker, I decided to chance it and parted with £75.00 for my all-day ticket. September came quickly and the master class day started well. 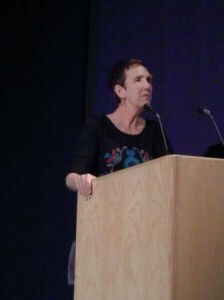 Registration was easy, after which Ann Cleeves opened the event. She was a funny and passionate speaker, and she took us through the process of writing her award-winning novel Raven Black, all the way from its inspiration, through the enjoyment of writing, to the tedium of editing. Among her tips for aspiring writers were; read widely across the genre, get to the end of the book, be lucky, write what you love, and good editors are “worth their weight in diamonds.” She was especially emphatic in calling for us to support our local libraries. After refreshments, it was time for the classroom sessions. The first was on character and setting, led by Laura Marney. She is a lecturer, short story writer, dramatist and author of four novels including Nobody Loves a Ginger Baby. Laura was funny and authoritative and her session was practical, challenging and very hard work. Her exercise on character was particularly useful – I discovered that one of my minor characters is a Goth. After a lovely buffet lunch, the second session, on plotting, began. It was led by Allan Guthrie, whose Two Way Split was Theakston’s Crime Novel of the year. He is also an agent and co-founder of a digital publishing house, Blasted Heath. Alan covered the essential characteristics of protagonists and antagonists and discussed the various ways in which a crime novel can be structured. Alan’s experience and forensic understanding of good crime writing meant his class was, like Laura’s, practical and encouraging. I’m already applying his analysis of structure to my own writing. After another refreshment break, the final event began. Chaired by Professor Claire Squires, Allan Guthrie (in agent mode) along with publishers Maxine Hitchcock from Simon and Schuster, and Rachel Rayner from Transworld discussed trends in publishing. It was fascinating and sobering to hear that good writing is only one factor in deciding whether to take a manuscript on. We also heard how we can help ourselves, e.g. by approaching agents as if we were applying for a job, by doing a creative writing course and having our manuscripts edited. This was a great chance to get the latest information, the best advice and the most authentic inspiration from some of the most accomplished people in their fields. The atmosphere was relaxed and friendly, thanks to the great organisation, so it was easy to network and gab on endlessly about writing. The day was inspiring, practical and hard work, and definitely worth the wait. I’m glad that I took that risk back in June and I’ll be back next year. 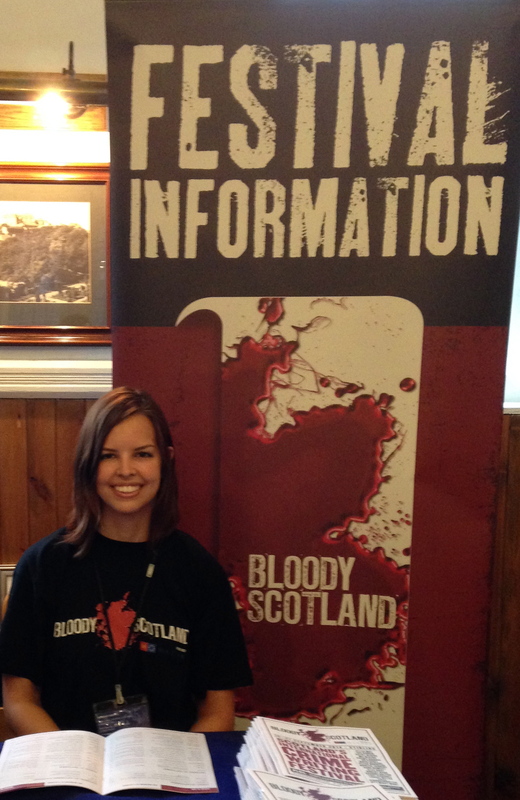 For more on Bloody Scotland, see Stefani Sloma’s report on volunteering at the festival. 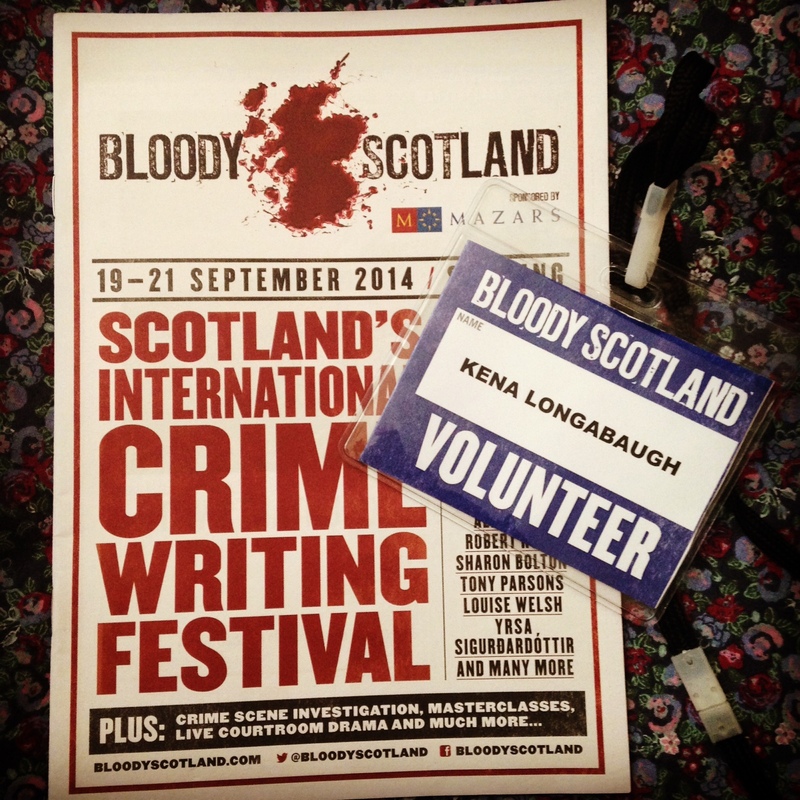 The first full weekend I was in Stirling saw me volunteering at Bloody Scotland, “Scotland’s First International Crime Writing Festival.” I’d heard about the event before arriving in Scotland and offered to volunteer during the weekend. I am SO glad that I did. I had the time of my life! Due to my previous experience volunteering at the Eudora Welty Writers’ Symposium at Mississippi University for Women, the Front of House Manager for Bloody Scotland, Dom Hastings, asked if I’d be willing to volunteer more than one four-hour shift. I wanted to say “Are you kidding me??!! DUH!” but I politely said, “I can be here whenever you need me.” I ended up being on the schedule all three days (Friday through Sunday) for pretty much the entire day; this was exactly what I wanted. Friday was the first evening of Bloody Scotland, and I worked the Author Hospitality room, where I checked authors in to the festival and gave them their name badges and goodie bags. I also worked at and helped set up the reception for the authors, which was the kickoff for the festival. After the reception, it was back to Albert Halls for the opening session called, “Why Bloody Scotland?” featuring Alex Gray, Lin Anderson, and Ian Rankin. This session was followed by an author signing, which is where I started getting authors to sign my program (more on this later). I loved these duties because it meant that I was able to meet EVERY author who came into the Stirling Highland Hotel to check in. Friday Night Highlight: Ian Rankin remembered me! I’ve met him previously, as I interviewed him last year for my honors research project (“The City as Character: Edinburgh in the Works of Ian Rankin”), and I was hoping that he’d remember me when I saw him again. HE DID! It made my entire weekend. We had a short conversation about the future of publishing and editors at the reception before I left him alone so he could socialize with other authors. Saturday began at 9 a.m. with the Author Hospitality room. I spent all of that day at the Stirling Highland Hotel. I worked FOUR signings that morning, meeting authors like Allan Guthrie, Sara Sheridan, Yrsa Sigurdardottir, Caro Ramsay, and more. After that I worked inside front-of-house for two events, which meant I operated the roving microphone and made sure the authors got to their signings after. My shift on Saturday was supposed to end around 3:30 p.m., but I was still needed so I didn’t leave until 7:45 p.m. I worked about 8 hours that day alone! Saturday Highlight: “Meet My Alter Ego” session with Gillian Galbraith, Aline Templeton, Tony Black, and chair Lin Anderson. At the session, the authors spoke as if they were their characters. This was fantastic, because at one point Gillian Galbraith spoke as her character about her author, so it ended up sounding something like, “Sometimes Gillian writes about things that even I don’t know!” or “She explains what happens to me even better than I could!” It was great. Sunday was the last day, and I can’t even explain how sad I was about this. It was spent at Albert Halls, where I worked inside front-of-house and signing for “The Next Big Thing” with Jade Chandler, Yrsa Sigurdardottir, Val McDermid, and Barry Forshaw. While they didn’t stay on topic much, it was a laugh and very interesting. I also worked inside FOH and the signing for “A Formidable Duo” with Quintin Jardine, Anne Perry, and chair Peter Guttridge. Sunday Highlight: I was able to attend the dramatized performance of “The Red-Headed League.” Stuart MacBride as Holmes was amazing. Every author I met this weekend was fantastic. Alex Gray remembered my name ALL weekend and called me “wonderful” and “a star.” I thought this was amazing. Also, Gordon Brown (not the ex-prime minister, but the red-headed crime fiction author, as everyone joked at Bloody Scotland) was one of the nicest guys I’ve ever met. I got him, Craig Robertson, Gillian Philip, and Gordon Ferris to sign books I’d bought by them. I also had TWENTY-FOUR authors to sign my program, which is something I will always treasure; I plan to have it framed! I am so glad that I decided to do this; I couldn’t afford to buy one book by every author I wanted to read and have signed, so I used my program. I think it was a great idea! I learned a lot about publishing, and I came to realize that I’d one day like to work festivals. It has also fueled my love for crime fiction, and I think I would like to work with it in the future. I think Bloody Scotland is one of the most amazing things I’ve ever been involved in. I’ve since had a few of the authors follow me on twitter, which is an honor. I hope to keep in contact with them and see them again next year! May 27th, 2012 by SCIPC | Posted in Blog | Comments Off on Sharpen your knives! 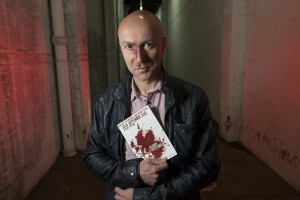 In association with Bloody Scotland, Scotland’s newest literary festival devoted to international crime writing, the University of Stirling will be running crime writing masterclasses on Friday 14 September 2012. Whether you’re trying your hand at crime fiction for the first time or already working on a novel, our practical classes – taught by the university’s creative writing staff – will help you hone your skills and get insights into the fast-changing marketplace. 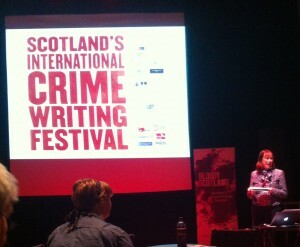 The masterclasses will begin with a keynote address from novelist Ann Cleeves on The Craft of Crime Writing. Ann has been writing crime for 20 years, and is author of the Vera Stanhope novels (now adapted by ITV) and a series based on Shetland. There will then be a choice of two workshops, The Plot Thickens: Shaping a Dramatic Story; Dark Alleys: Creating Atmospheric Settings; and Victims and Villains: Developing Convincing Characters). In these workshops, you’ll get the chance to develop your own writing. The day will end with an expert panel of agents and publishers, featuring Maxine Hitchcock, Editorial Director at Simon & Schuster, Bob McDevitt, literary agent at Jenny Brown Associates and Professor Claire Squires, Director of the Stirling Centre for International Publishing and Communication. Tickets are selling fast for the masterclasses and other Bloody Scotland events, and are available via the Bloody Scotland website.